stood between them gave a solution to the fire problem in California. Trumpty Dumpty said "Finland (which is in the arctic) doesn't have fires because they rake the forest floor!" You just can't make this stuff up. He's a total MORON!! 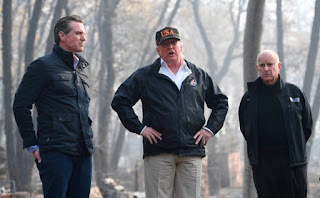 They likely knew if they laughed or made a face that he would cut off all funding for rebuilding Paradise after this fire. Rake?? Rake?? Really?? We're living in a unprecedented time and have been for the last two years. Take a drive across highway 88, California to Nevada, see the cleanup there.